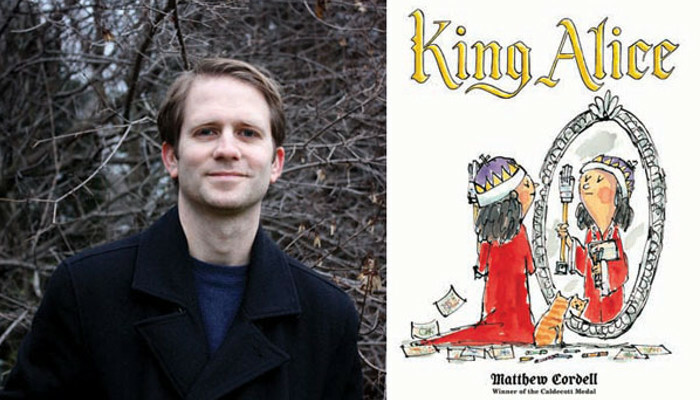 One of the picture books I’ve been eagerly anticipating is finally here: Caldecott’s Medal winner (WOLF IN THE SNOW) Matthew Cordell’s KING ALICE, about a little girl and her family stuck indoors on a snowy day. When Alice’s dad suggests she create her own book to combat snow day boredom, all sorts of imaginative shenanigans ensue! JOY: You’ve mentioned in your blog—in the context of talking about your Caldecott Medal winning picture book WOLF IN THE SNOW— that WOLF was the first of the books you’ve authored and/or illustrated that did not start with a story from your own life. But now here is KING ALICE, which clearly seems drawn from real family life. But to expand the obvious question here a bit: Can you talk about your artistic choice to tell the story of this dad’s snow day with his family both through the text and illustrations and through Alice’s cartoon book renditions? It made the story such fun! MATTHEW CORDELL: Thanks so much! King Alice was directly inspired by my own creative, headstrong daughter, and a day we spent making a book together. She was about 5 years old at the time, and knowing I make books for a living, she wanted us to make a book together. She was really into Wizard of Oz at the time, so it was really just a kind of chaotic retelling of that story. She would write bits of text and draw and I would do the same. It was a lot of fun! So the whole process of a dad and daughter making a book turned into a book about a dad and daughter making a book! JP: How fun that you could indeed turn real life into fiction! And speaking of your daughter, you do write about family a great deal. In fact two of your best selling books in store are DREAM and WISH, both of which are very beloved. Both of those titles deal with the hopes for children (in all senses of that phrase), but with a lovely subtlety. ALICE is obviously different: family already established and with a comedic intent about that crazy snow day. As an artist, what draws you to the subject of family? MC: First and foremost, my family is the most important part of my existence. I’m happiest when I’m with my wife and kids. I love doing fun things with them and watching my kids grow and do and say the most fascinating and funniest of things. Watching my kids come into the world and being blessed with their existence (having children did not come easy for my wife and me) was an incredibly emotional experience for me and continues to be so, as they grow up and learn and navigate the ways of the world. It’s all very rich material to mine from when I make my books. I make books for families--both children and adults--so with children’s books, it’s a perfect place to express these things, artistically. JP: What a lovely answer! Now let’s turn to what I’m sure was another very emotional experience: What’s changed for you since the Caldecott? What hasn’t? MC: The Caldecott has changed a lot for me professionally. Lots of sudden foreign editions and offers, lots of sudden requests for speaking engagements and travel, advance book deals are locked down for years to come. It’s both a very fortunate and peculiar mindspace to be in. There are moments where I remember that I’m one of only 71 artists who have won this since 1938. Out of the countless number of books that have been published in that time. It’s mind-blowing that I’m part of this legacy. Then there are times (most of the time, honestly), where I’m really just going about my work and life--drawing and painting or washing dishes and taking out trash, getting groceries, wiping bottoms and picking up the kids from school--where I don’t think about it at all, and I’m just living life as I always have, unchanged. JP: I will definitely agree that dishes, diapers, and grocery shopping keep one humble! But now I’d like to shift gears from the award to process. Your illustrations in KING ALICE do a lot of quiet heavy lifting in terms of diversity: Alice’s proclamation that she is King not Queen, for one. And the clearly bi-racial family. How much does wider representation fit into your creative process? MC: As creators and occasional role models for youth and growing minds, I feel we have a responsibility to represent a range of walks of life. Different races and nationalities, different religions, different sexualities (probably more so with older readers), and both boys and girls. The world has always been unfair to its minorities. We seem to be in a particularly ugly time for that right now. If I can do my part to help a child, or help a child to understand or normalize respect and empathy and acknowledge diversity in the world, then I must do that. JP: And speaking of illustrations, who and what are your artistic inspirations? MC: I love art and artists who are loose and unusual and organic in their work and approach. Sophie Blackall, John Burningham, Beatrice Alemagna, Sydney Smith. I really love loose pen and ink drawing, so I’ve long been a fan of the likes of William Steig, Quentin Blake, and Jules Feiffer. I also love artists who brave trying out different styles and mixed media. David Ezra Stein, Denise Fleming, Paul Zelinsky. JP: So interesting! We are definitely fans here at Brazos Bookstore of the unusual! And now for your Chicago Bonus, since you live in Chicago and I grew up there and have my own memories of crazy snow days. JP: Favorite Chicago hot dog place? MC: I like Chicago-style hot dogs, but I’m not much of a meat eater! There’s a fantastic little hot dog stand outside of the Field Museum that sells Chicago-style veggie and turkey dogs. We stop there every time we go to the Field! JP: Cubs or White Sox? JP: Painting or other art you always have to see at the Art Institute? MC: Marc Chagall’s America Windows. JP: Green River: Soda pop of the gods or gross? MC: Heh… not my favorite. And I like soda pop! JP: Well, I’ll have to let you slide on the Green River thing because I totally agree about Lou Malnati’s! It’s the best! Thank you so much for this wonderful conversation. We are so thrilled to finally have KING ALICE on our shelves! Want to know more about the fabulous Matthew Cordell and his books? Then head over to his website.